There will be no construction update issued for the week of Nov. 21 due to the Thanksgiving holiday break. The update will resume the following week. Fireproofing of steel beams on the fourth floor is expected to be completed this week. The installation of ductwork and piping on the first and second floors is scheduled to continue through Dec. 6. The framing of walls on the first floor is scheduled for Nov. 21 through Nov. 29, and on the second floor between Nov. 22 and Dec. 1. MEP rough-in (R.I.) in wall framing at the first floor will occur between Nov. 23 and Dec. 7, and on the second floor between Nov. 25 and Dec. 8. Tarlton Concrete crews have been busy completing grade beams along column A of the garage. Approximately 150 cubic yards of concrete was poured earlier this week. After Thanksgiving, crews will be back in that area to finish the backfill and rock between columns A and B. Upon completion of the grade beams, Tarlton Concrete crews will finish up the section of foundation walls along columns D and C before Thanksgiving. The southwest corner of the site is starting to look more like a garage. To date, the erection crews have set 18 double tees, 4 shear walls, 5 spandrels panels, and 12 columns. The first section (Columns 9-10) will be completed by the end of this week. 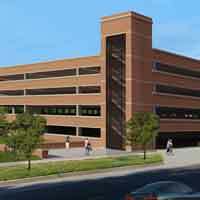 Parking spaces along the east side of the existing garage are still blocked off for construction for safety reasons. Those spaces are expected to be restored the first week of December. Be aware that there will continue to be a steady stream of trucks to the site between now and February.